Umut Adan’s unique brand of Turkish psychedelia draws on the heady influences of the 1960s Anatolian rock movement. With a truly vintage feel, Umut’s songs represent an important social commentary on the conflicting tensions of his homeland. Born and bred in the cultural melting pot that is Istanbul, singer/songwriter and guitarist Umut Adan fell under the spell of the Anatolian rock movement which developed in Turkey during the late 1960s by blending Turkish folk music with Western rock. Bahar, translated as ‘Spring’, is Umut’s debut international release which pays respect to the innovative pioneers of this bygone Turkish rock scene such as Cem Karaca, Fikret Kızılok and Erkin Koray whilst depicting the current tumultuous changes which are taking place in Turkey. With a truly vintage and psych/rock inflected feel, Umut’s songs represent an important social commentary on the conflicting tensions of his homeland. 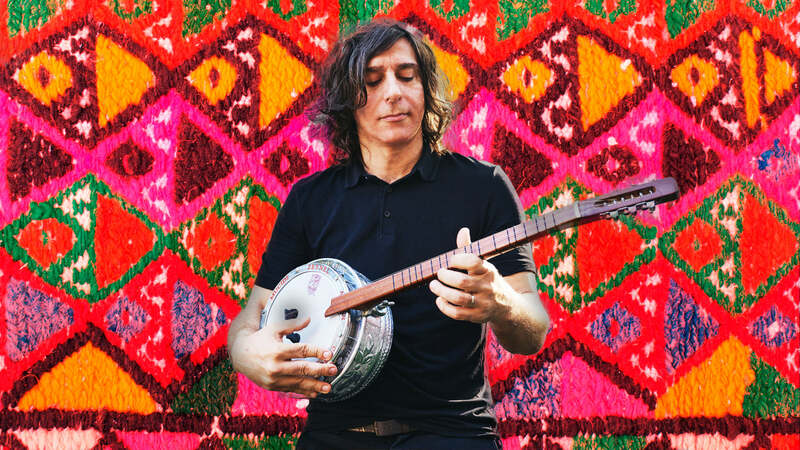 It was this combination of heartfelt integrity and unique retro sound that led Jack White to select Umut as the opening act for his Turkish tour, from whence he hasn’t looked back. Recorded at Toe Rag studios in London, Bahar was produced by Marco Fasolo and studio founder Liam Watson, famed for engineering and mixing the White Stripes Grammy-winning album Elephant in 2004, as well as other classic garage rock revival albums. The vintage analogue recording of the album blends timeless/retro elements with a modern sonic approach, giving particular emphasis to the vocals and message conveyed in each song. This is very much in evidence for the classic album opener ‘Bembeyaz Cananım’, a song dedicated to Muhlis Akarsu, a well-known performer and composer of Turkish folk music. The song itself is about what it means to write popular Anatolian music today: music for the people from the people. A particular favourite of Umut’s, ‘Güneş’ beautifully conveys the classic psychedelic era feel with its fuzz guitar and atmospheric Mellotron arrangement by Marco Fasolo. Likewise an irrestible blast from the past guitar riff accompanies ‘Sevdiğimi Seçtim’, Umut’s most personal song about those who follow their inclinations. Although ‘Kadıköylü’ is another track steeped in heady psychedelic sounds, this is a modern metropolitan song about Istanbul and its different ways of living and alludes to Kadıköy, one the most modern neighbourhoods where its inhabitants are renowned for their Westernised lifestyle. Along with his self-penned songs, Bahar includes two covers ‘Arabam Kaldı’a folk song by Mahsuni Şerif and ‘Zaman Zaman’ a classic rendition of a love ballad by the Anatolian rock pioneer Fikret Kızılok, who was a friend of Umut’s family, and remains a huge influence on his song writing. Likewise the strategy of disguising a political song as a love song is an old trick which Umut has inherited from the 1970s Anadolu rock tradition which he uses to great effect in ‘Ortasından Gel’, at face value a love song ,but in actual fact a song with a deeper meaning about the current state of civil rights in Turkey (especially after the Gezi Park protests). Now living in Italy, Umut is able to look at his homeland from both sides and expresses his concerns in ‘Bandırma Başkent Oldu’, undoubtedly the most overtly political song on the album, about the decision taken by the current government to promote the small city of Bandırma to capital of its province because of local political machinations. A fitting closure to the album ‘Ana Baba Bacı Gardaş’, is a song about the possibilities for humankind to better itself even outside religious creeds: a truly tricky theme in today’s Turkey. From political paranoia and manoeuvring to the hopes of freedom and harmony circulating amongst the Turkish youth, Umut Adan’s musical message is deep and meaningful whilst at the same time paying a respectful tip of the hat to the artists of the Anatolian rock heyday.